Bedford Vehicles was a subsidiary of Vauxhall Motors, itself part of the US based General Motors, the 'Chevrolet Bedford' having been produced at Luton from 1929, named after the nearby county town of Bedfordshire. The name of this model became the name of the brand, and Bedford Vehicles was formally established in 1930. The Bedford CA van, with a distinctive 'pug-nose' was produced from 1952, replacing existing models which were largely to pre-war design. The CA was built mainly as a light delivery van, although specialist bodywork (e.g. ambulance, ice-cream van) could be fitted, and the Bedford Dormobile camper was based on the CA Van. 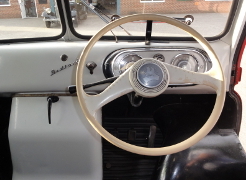 A three speed gearbox, with steering column mounted gear lever is fitted. The CA van continued in production until 1969 when it was replaced by the CF model. 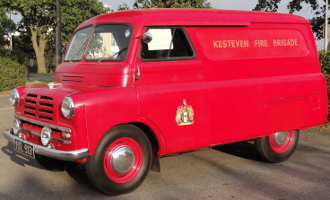 This van was new in 1954 to Kesteven Fire Brigade, Sleaford, for non-emergency duties, e.g. transporting supplies, fire hydrant maintenance and repairs. It shows the early styling of the CA model - a single piece windscreen and revised front grille were introduced in the late 1950s. 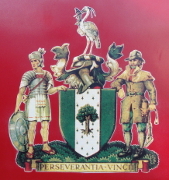 Kesteven County Council (or 'Lincolnshire, parts of Kesteven') was, along with Lindsey and Holland, one of the three administrative counties that were merged (with the exception of the north Lincolnshire areas which became Humberside) to form the post-1974 county of Lincolnshire. Preserved for over 35 years now it is in lovely condition and was on show at the museum for the Heritage weekend in September 2012. Our sincere thanks go to Pete Holland for the very generous donation of this most delightful local and once popular type of van. April 2013 - The Bedford has seen quite a bit of work since the new year, the gear linkage has been removed and new bushes made, now refitted its possible to select all gears cleanly and it is much easier to drive. The rear wheel arch has been re -made and refitted to the van and the whole lower half of the inside rear has had a fresh coat of paint. A few other service items have been addressed and we are planning to replace the cracked tyres in the near future. October 2013- At present the wiring to the rear lights is being sorted out. The MOT is due in the near future. January 2015 - "Miss Piggy" is due an MOT which will require work on the steering track rod ends where there is too much play to get a pass. April 2015 -  Miss Piggy has now passed its MOT following work on the steering.